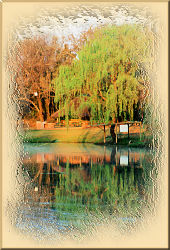 GREEN LEAVES COUNTRY LODGE AND WEDDING VILLAGE IS SITUATED AT THE FOOT OF THE MAGALIES MOUNTAINS. Our formal lounge is a haven for those who enjoy relaxing with a good book, in front of the fireplace. A magnificent view of the Hartebeespoort Dam is seen from the lounge verandah. Indulge in a sundowner or a relaxing game of pool at the bar. Guests are welcome to cool down in the pool or to just sit back and enjoy the view. 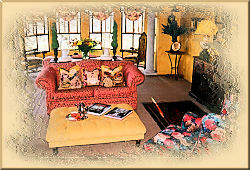 Our Bed & Breakfast accommodation transports you back to a time of romance and luxury. 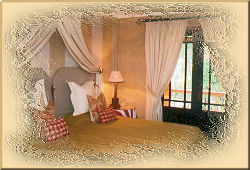 Each suite has a private balcony which overlooks the Skeerpoort valley and Magalies mountains. In these comfortable rooms are twin beds, a TV and an en suite bathroom with shower. Our Presidential / Bridal suite has a separate lounge area. The romantically decorated bedroom has a cosy fireplace and an en suite bathroom with jacuzzi bath & shower. 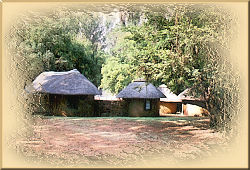 a lapa with rondawels, luxury safari tents and a cottage retreat. The lapa comprises of five separate units. There is a fully equipped kitchen and a central braai area or boma. The rooms are furnished with twin beds. An additional two rondawels have been converted into separate bathrooms. Informal conference facilities are available at the lapa. For the ultimate African experience, we have four luxury safari tents which sleep three people. Each has an en suite shower, kitchen, wooden deck and braai area overlooking the pecan nut plantation. As you wander, you may discover a cottage, hidden amongst the bamboo and pecan nut trees. This cosy retreat consists of three bedrooms, bathroom, lounge with fireplace and a fully equipped kitchen. We have converted old stables into a romantic Tuscan venue for weddings and functions. The venue can seat up to 200 guests and has a dance floor. The Stables has its own fireplace, bar, buffet and reception area. 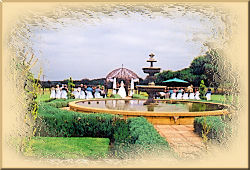 For a perfect wedding service you have a choice between The Chapel and The Garden Gazebo. For a fairy-tale wedding, our horse carriage will pick you up at the bridal suite & take you down to the chapel or to the garden gazebo. 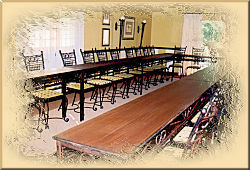 We have facilities for informal conferencing for approximately 40 people and formal conferencing of up to 30 people. Whether formal at the main lodge or informal at the boma, we can accommodate all your conferencing requirements. Our outside, open sky boma is perfect for small functions and group bookings. Do contact us for any further enquiries.